Tomorrow will be six years since I first launched this blog, which kind of blows my mind. It seems like the time flew by, but somehow I managed to accumulate over eight hundred recipes and turn the site into a full-time business that replaced my law career. 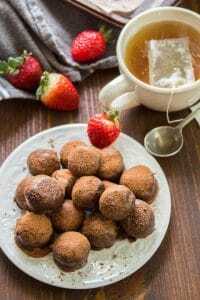 Anyhow, I first published the recipe for these truffles right around the site’s one year birthday. Just in time for Valentine’s Day back then. I decided resharing the recipe with a bit of an update and some snazzy new photos would be the perfect way to celebrate this Valentine’s Day and six years of blogging. Oh man, I forgot how good these suckers were! I must have had more self-control the first time making them, because back then I sent most of the batch to work with my husband (then boyfriend). This time we managed to polish off the whole batch ourselves. I’m hoping I can again quickly forget how good they are, because unfortunately, they’re really easy to make, and I usually have all the ingredients on hand. So, what might those ingredients be, you ask? Almond butter (I love Trader Joe’s brand), cocoa powder, shredded coconut, salt, coconut oil, and vegan chocolate chips. You can add in other flavors like cinnamon (probably delicious), or nuts to roll them in (also probably delicious), if you like, but they’ll still be amazing if you don’t. Mix your almond butter, cocoa, maple syrup and salt in a bowl. The mixture should be super thick and fudgy. This is your truffle filling. Next, melt your chocolate chips on the stove or by microwaving them in batches. Add the coconut oil and stir until that melts too. Next, roll your filling into balls and dip it in your melted chocolate. I like to use a little fondue fork, but toothpicks work too, or your bare hands if you don’t mind getting messy. 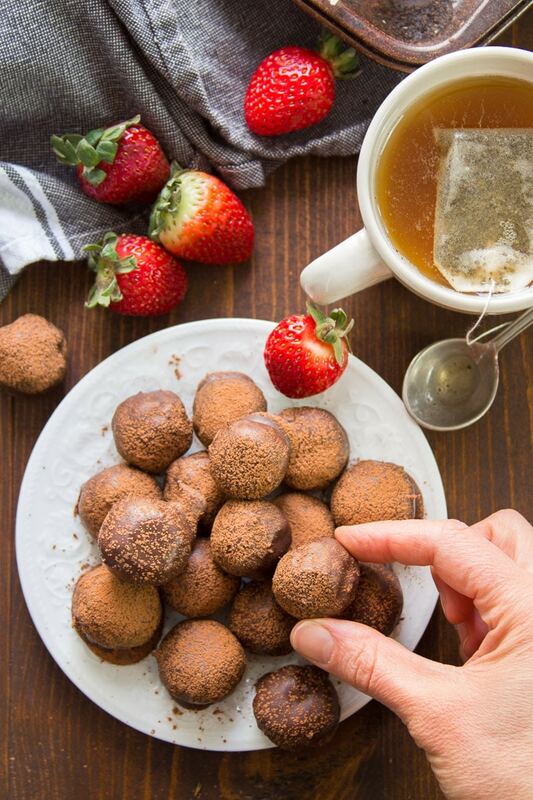 Transfer your dipped truffles onto parchment paper and let them sit until the chocolate sets. Once they’re done, give them away as soon as possible, otherwise there’s a good chance you’ll polish off the whole batch yourself. Feel free to add your favorite ingredients and flavors! Cinnamon, vanilla extract, and peppermint extract would all be delicious in the filling. You could also roll the truffles in some finely chopped nuts or add them to the filling. Where can I find vegan chocolate chips? I use Enjoy Life brand, which my regular supermarket carries. If yours doesn’t, try places like Whole Foods, or order them on Amazon. How long do these keep? I’ve kept them around up to a week at room temperature (though I suspect they’d be fine for a few days more than that). You can also seal them up and freeze them for a couple of months. I’m allergic to almonds/I hate almonds. Is there a substitution for the almond butter? Use your favorite nut or seed butter instead! I’m allergic to coconut/I hate coconut. Is there a substitution for that? You should be able to leave it out with no problem. Add an extra tablespoon of cocoa powder if your filling seems too runny. Mix the almond butter, coconut, cocoa, maple syrup, and salt together in a small bowl. Add a bit more almond butter if the mixture seems too dry, a bit more cocoa if it seems too runny. Melt the chocolate on the stove top or by placing it into a bowl and microwaving in 30 second increments, stirring between each increment. Stir the coconut oil into the chocolate. Keep stirring until it melts and completely blends with the chocolate. 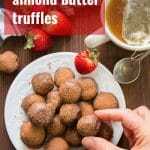 Roll the almond butter mixture into into 3/4-inch balls. Line a large cutting board or baking sheet with a sheet of parchment paper. 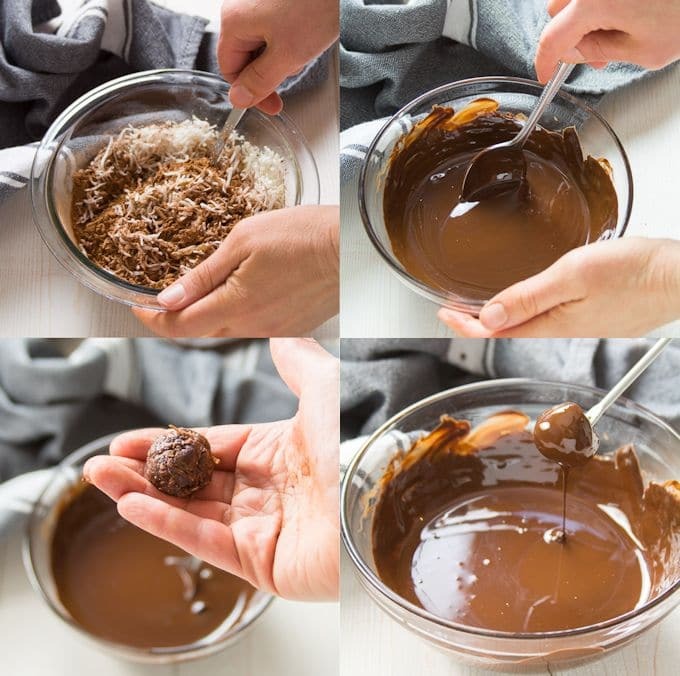 Use a fork or toothpick to dip the balls into the melted chocolate mixture. Roll each one gently to coat, then transfer it to the parchment lined board. Allow the dusted truffles to sit for at least 1 hour to set. 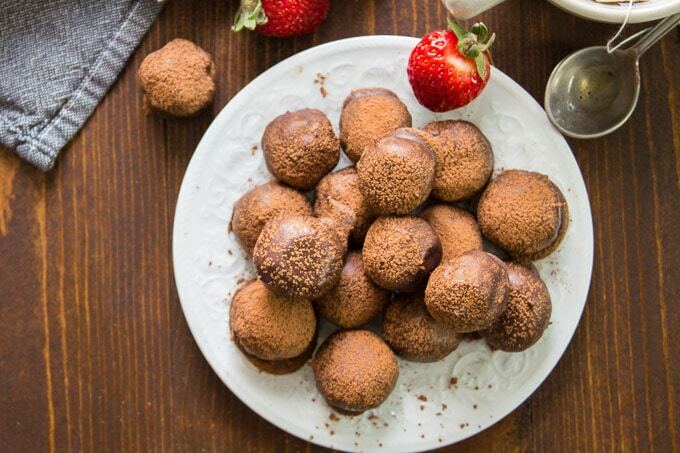 Dust the truffles with cocoa powder. I only used 1/8 teaspoon of salt, because my almond butter was salted. You may want to use closer to 1/4 teaspoon (or more, if you like) if yours is unsalted. Taste-test the filling and adjust the amount as needed. Amazing recipe, they could almost double up as a healthy protein snack, really amazing. Happy Blogiversary! Thank you for the Blogiversary wishes!!! I was panicking yesterday because I really wanted to make a treat for my husband, for my coworkers, for my parents anniversary, AND for our real estate agent who just helped secure our first house. I didn’t know how I was gonna have time to make something for THAT many people, with no time and very little budget. First, I was just about a teaspoon short on maple syrup, so I used honey for the remainder. I actually really liked the flavor that little bit of honey added to everything. I also had really, really, bone-dry almond butter, so I warmed up some coconut oil to help everything mix properly. It was perfect!! OK, totally making these today. No lie. I will happily make these truffles for a V day dinner party next week without a back-up plan because your recipes *always* turn out. Thanks for your many, many delicious, creative and reliable recipes and wonderfully clear instructions. Thanks so much Elle! I was working as a full time lawyer just until 2017. :) I’m so glad you’re enjoying the recipes! I hope the truffles are a hit!